68Gallium prostate-specific membrane antigen positron emission tomography/computed tomography ([68Ga] PSMA PET/CT) is an imaging exam that outperforms CT, magnetic resonance imaging (MRI), and bone scintigraphy with respect to accuracy of primary staging of high-risk prostate cancer patients, according to nuclear medicine physicians and a multidisciplinary team of gastrointestinal cancer specialists at King Hussein Cancer Center in Amman, Jordan. Its use changed treatment management for more than half the patients of a retrospective study published online September 13th in Molecular Imaging and Biology. hypodense liver lesion reported by CT scan. The King Hussein Cancer Center offers 68Ga PSMA PET/CT to men diagnosed with intermediate- to high-risk prostate cancer for primary staging purposes. The Center strongly recommends its use if lower abdomen CT or MRI scans and bone scintigraphy show equivocal findings. The researchers identified and analyzed the initial clinical and radiological findings of 21 men with high risk prostate cancer who had work-up and treatment between January 2015 through December 2017. 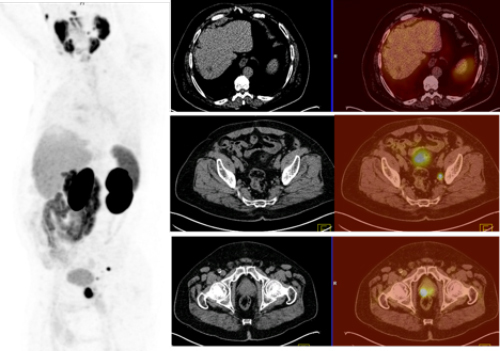 They analyzed the role of [68Ga] PSMA PET/CT, and stratified concordance and discordance of each imaging modality on a per-patient basis and a per-lesion-site basis. In addition to the [68Ga] PSMA PET/CT scan, 20 patients had a CT scan, 15 patients a MRI scan, and 16 patients a bone scan. Twelve patients, or 57%, had all four examinations. PSMA-avid lymph nodes were identified in 11 patients. Principal investigator E. Akram Al-Ibraheem, chairman of the Department of Nuclear Medicine and PET/CT, and colleagues determined that [68Ga] PSMA PET/CT had the highest concordance rate at 90%, compared to bone scintigraphy at 75%, MRI at 73%, and CT at 60%. [68Ga] PSMA PET/CT and MRI and a comparable diagnostic accuracy and sensitivity with respect to detecting suspicious lesions within the prostate gland, but [68Ga] PSMA PET/CT was superior with respect to detecting suspicious pelvic lymph nodes, at 92% versus 75% sensitivity and 100% versus 86% specificity. It outperformed CT by detecting 95% of the suspicious pelvic lymph nodes compared to 75% respectively, and by detecting 100% of extrapelvic lymph nodes compared to 75%. Compared with bone scans, [68Ga] PSMA PET/CT detected 100% of suspicious bone lesions, whereas bone scans detected only 63%. By adding a [68Ga] PSMA PET/CT scan, 11 patients had clinical management changes. Seven patients were upstaged when additional bone lesions, pelvic lymph nodes, and extra-pelvic lymph nodes were detected. The authors reported that treatment changed from radiotherapy or chemotherapy to systemic hormonal therapy. Four patients were down-staged, when [68Ga] PSMA PET/CT scan excluded bone and liver metastases, and ruled out pelvic and extra-pelvic lymph nodes that had been identified as suspicious on one or more of the other imaging examinations. The authors reported that Gleason scores, prostate-specific antigen (PSA) levels, and per-lesion site factors did not cause significant differences among the different imaging modalities. However, CT scan accuracy was greater in patients with iPSA greater than 20 ng/ml. Hirmas N, Al-Ibraheem A, Herrmann K, et al. [68Ga] PSMA PET/CT improves initial staging and management plan of patients with high-risk prostate cancer. Mol Imaging Biol. Published online September 13, 2018. doi: 10.1007/s11307-018-1278-8. 68Ga PSMA PET/CT improves initial staging of high-risk prostate cancer patients. Appl Radiol.